News: designs have been revealed for one of Zaha Hadid's smallest new structures – an advertising billboard for a stretch of road in west London that the architect says will "create a new genre in the roadside advertising canon". 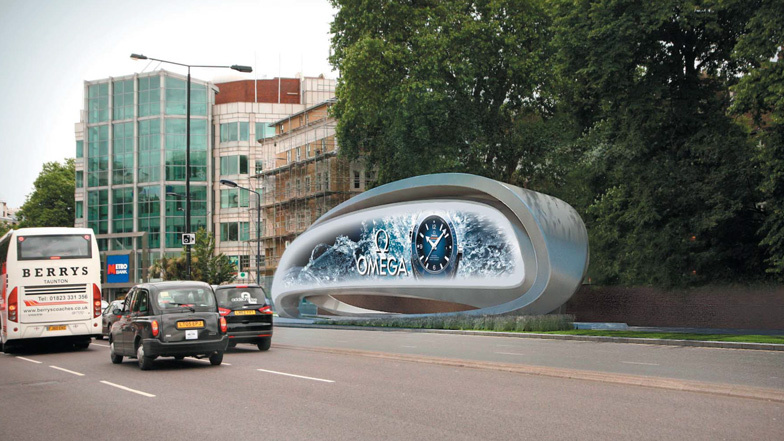 Zaha Hadid was commissioned by outdoor advertising company JCDecaux to design a "curved and flowing" billboard for a narrow plot of land on the south side of West Cromwell Road – one of the main routes into central London from Heathrow airport. Described as a "unique double ribbon structure", the sign will feature a single digital advertising screen facing west, housed within twisting bands of thick sheet metal with a matte finish to reduce glare from sunlight and vehicle headlights. According to planning documents submitted to the London Borough of Kensington and Chelsea by JCDecaux, the billboard's structure will be a "monococque" that "allows for the steel structure and facade panels to be integrated into one shell and thereby provide an overall reduction in structure size to create a slimmer form." "The form entails a twisted ribbon wrapping around the screen with its display capable of blending into the form, enhancing the form and moving beyond the traditional rectangular advertising format," said a statement from Zaha Hadid Architects. "The contrast between the organic structure and its surroundings enhances the character of the area, which adjoins one of the busiest trafficked routes into London. Its distinctive features can act as an iconic focal point to an area that is currently uninspiring and suffering from an overall sense of neglect and dearth of identity." A strip of lighting across the curved back of the structure will illuminate the pavement, replacing existing traditional lamp posts. Pedestrian lighting will also be integrated into the landscaping and a brick planter at the end of the site nearest the junction between Earl's Court Road and West Cromwell Road. The choice of metal as the main material for the project means it can be pre-fabricated off site in large sections. The project has been altered according to guidelines provided by the borough during a pre-application process. As well as showing advertising images, the screen will be made available to Transport for London for promoting safety messages and travel updates and will be used to show work by local artists, designers and architects on monthly rotations. "The aim in this scheme is to develop an inspiring and striking built form that crosses the line between media platform and public art. The proposal represents a significant investment in the site and the development of an architectural form that will create a new genre in the roadside advertising canon," said the architects. An existing pavilion building, used mainly to host two 12-metre-long advertising spaces on the roadside facade, will be completely demolished to make way for Hadid's design. "The demolition of the existing building and its replacement with a slender designed structure to create a more open rear footpath will significantly improve the experience and safety for pedestrians," said the architects. The Kensington and Chelsea planning committee is due to make a decision on the proposals on 20 January 2015. Zaha Hadid's increasingly diverse portfolio has expanded considerably over 2014, with new projects including jewellery, an installation at London's V&A museum, exhibition design, 3D-printed chairs, a handbag, cantilevered shelves, a smart "cuff" for Will.I.Am and a range of homeware released by luxury department store Harrods. Earlier this year the architect also unveiled her first wooden building and a trio of towers for Brisbane, Australia.